Ignorance Made Us Hungry: My website, my url. With a great website, comes great responsibility. I recently purchased http://www.justindelacruz.com/. With hosting and a domain name, it was $10 down, and it'll be $7 a month, with month-to-month payments (no longterm contract) through Go Daddy. But just now, I began thinking about all of the things I could include on my website, and I got overwhelmed. I suppose the best approach will be to start with something very simple and try to build on that. So the CMS, the color schemes, and the homepage layout will be the first monsters to tackle. Given that I'm working and taking a class and doing an internship right now, I don't think I'll have this off the ground until the end of summer. *Sigh* I wish I could just do it all right now. 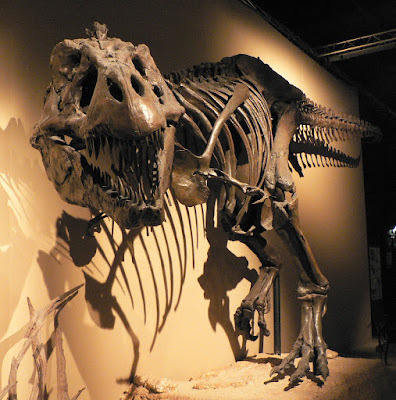 And, because there haven't been any pictures here, and because I don't know how to wrap up this post, here's a picture of a T-rex. Dude, if you're looking at CMS, try Drupal. It's really robust and there's a great community of developers, so anything you want to do, you can do (Check out Dave Matthews Band, Pearl Jam, and Michael Jackson for a few examples of Drupal sites). Something to think about though: Couldn't you just set up a redirect to make your current blog appear at justindelacruz.com? YES, I could. Smartypants. Or I could just post a giant picture... or that giant SWF of the dog licking the glass. Drupal was actually at the top of my list to try out. Other ones (Wordpress, Movable Type) seem more blog-oriented. I just want awesome-oriented. I do love Wordpress... and Drupal is not without its headaches. It helps to be willing to learn a little PHP, and migrating from development to live site can be kind of a pain. I have a book about Drupal I can loan you, if you want to scope it out.